July home sales were robust, but couldn’t reach last year’s levels, down – 4.85 % compared to July a year ago. Home sales this month were 2,431 compared to 2,555 in July 2016. 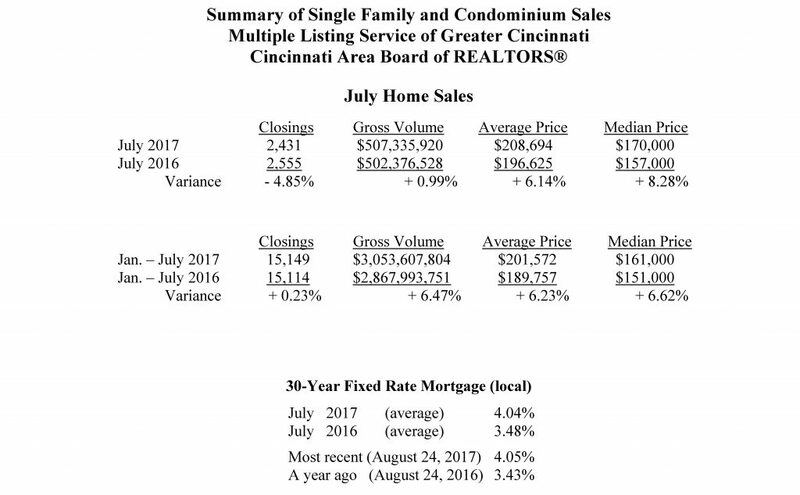 “Even though July 2017 home sales slowed a bit, it is still the 4th highest July ever for sales,” said David Welch, President of the Cincinnati Area Board of REALTORS®. “Home sales remain strong and, from all indications, should remain strong through the end of this year,” said Welch. The average home price climbed to $208,694 compared to $196,625 a year earlier, a + 6.14 % increase. At the same time, the inventory of homes for sale, as of July 31, continued its year-over-year declining trend to 5,662 from 6,985 a year ago, down – 18.71 %. The average price of homes set a new record for the month of July, extending our consecutive record months of average home sale prices to fourteen. “Our inventory numbers remain low due to the continued, quick turnover of property. In many instances, the home sells quickly. The market is strong and property that is in “move-in” ready condition in a desired location is selling quickly, sometimes with multiple offers. We have buyers that are ready to purchase the home of their dreams. Today, more than ever, we need those consumers who are ready to or thinking about selling their home, to list with a Realtor,” said Welch. Local home mortgage rates in July averaged 4.04% for a 30-year fixed rate loan. The rates were up compared to 3.48% a year ago. At these fixed rates, the monthly principal and interest payment on a $100,000 home loan with no money down would be approximately $480. Nationwide, July home sales were down – 1.3 % from June on a seasonally adjusted basis, but were up + 2.1 % from July 2016.